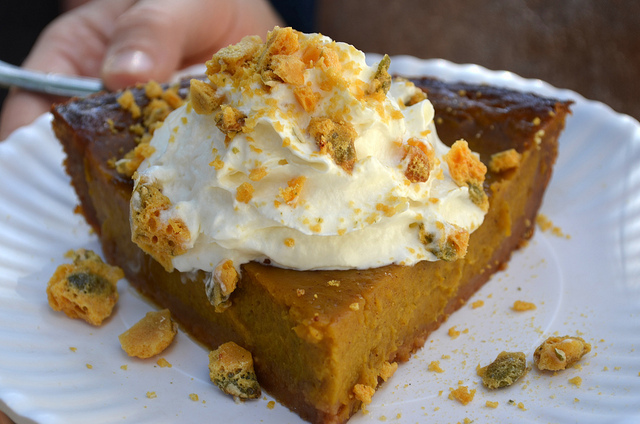 Pumpkin pie with pumpkin seed brittle and whipped cream in a graham cracker crust at Bang Bang Pie Shop. "There are three things you must never discuss with people: religion, politics, and the Great Pumpkin." Poor Linus. What would he do this election year? Me, I must discuss the great pumpkin pie I tasted last Friday at Bang Bang Pie Shop. 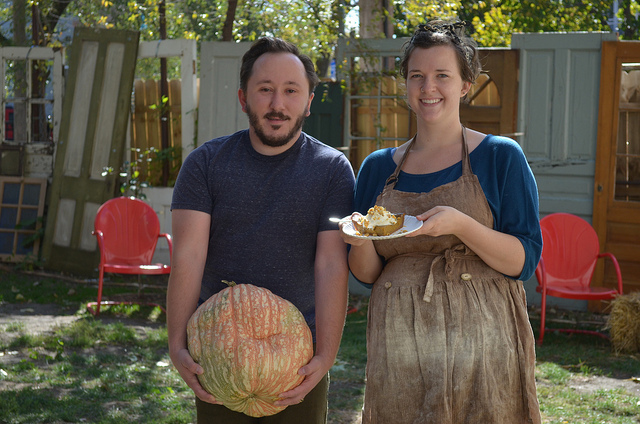 It was the new pie shop&apos;s first ever pumpkin pie, on the first day of its release. 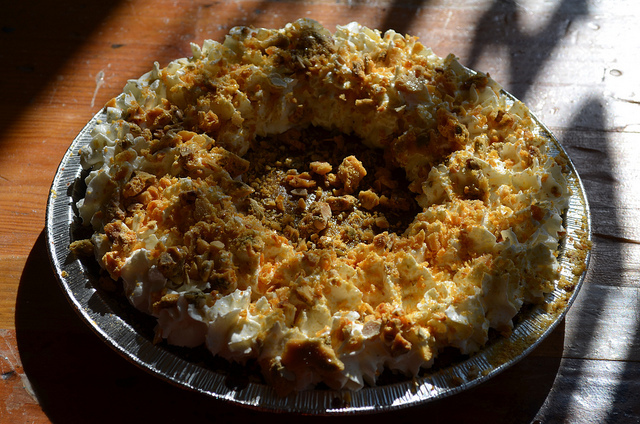 Head pie maker/co-owner Megan Miller uses real pie pumpkins to make an old fashioned filling for her signature graham cracker crust, which nearly candies and caramelizes around the custard. The dish is topped with real whipped cream and her pumpkin seed brittle, which elevates this home-style slice to elegant plated dessert. And yes, Miller makes the delicate honeycomb brittle with seeds from the pumpkins. 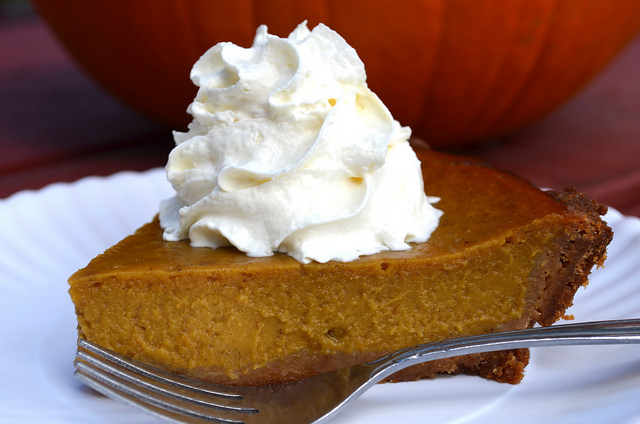 You may remember last year I revealed the truth about pumpkin pie: Most pumpkin pies are not pumpkin, but squash instead, much of it grown in Morton, Ill., "The Pumpkin Capital of the World" and home of Libby&apos;s. One commenter asked, "How many hours can pumpkin pie sit on the counter before I can refrigerate it?" The much belated short answer: two hours, according to the USDA&apos;s Food Safety and Inspection Service Two-Hour-Rule, mentioned on their holiday goodies fact sheet. In case you missed my mention, the Great Highwood Pumpkin Festival kicks off Thursday, culminating in an attempt to break the world record for most lit jack-o-lanterns with 32,000 pumpkins. It bears repeating because it&apos;s one of our most spectacular — yet surprisingly unknown — local fests. 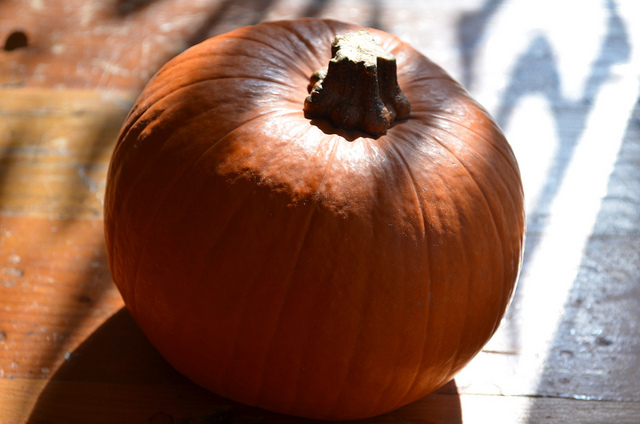 Evidently many headline writers couldn&apos;t resist; every other report says this year we&apos;re having a smashing pumpkin season, not in spite the drought, but because of it: Pumpkins like hot dry weather. Perhaps the Great Pumpkin heard our prayers after all.